This will be James' fifth Christmas. 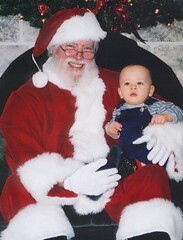 Between the ages of one and four, James wouldn't sit on Santa's lap. When he was one he was too little to fear anything so he just sat there like Daddy and Mommy told him. Then, he got too smart to sit on some stranger's lap, even if Daddy and Mommy told him it was okay. This year, he's back on the saddle because he knows the big guy is going to reward him with gifts on Christmas morning. This will be Michelle's third Christmas. 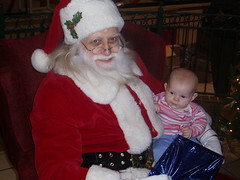 Unlike James, Michelle was more than happy to sit on Santa's lap this year. I don't know if that's a good thing or a bad thing, but Grandma was there telling her it was okay. That made this the first year both kids sat on Santa's lap and told him what they wanted. I don't think either asked for world peace. Here are pictures from James' and Michelle's first Christmases. Note that both Santas have legitimate beards. No fakery here!